This entry was posted in Bicycles and tagged Bicentennial Bikeway, Bikeway Coffee & Juice Bar, Brisbane River Loop, Cafe, Coffee on 7 October 2013 by Rex. 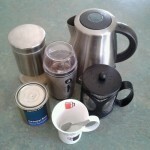 This entry was posted in House & family and tagged Coffee on 27 February 2013 by Rex. This entry was posted in Tasmania and tagged Coffee, Family, Launceston, Road Trip, Tasmania, Tasmania Trip, Travel on 24 December 2010 by Rex.